The United States of America began quietly on a small island in the James River, and there was no way that these rugged settlers could conceive of the incredible nation that would evolve from their landfall 400 years later. The Jamestown Hook BraceletTM is a tribute in precious metals to these hardy souls that struggled to build a home and a nation. A "J" shaped with nautical line represents the island of Jamestown, and it hooks an anchor, symbolizing the safe arrival of our forbearers as they dropped anchor at the end of this incredible voyage. Two gold wraps represent Capt. John Smith and Pocahontas whose chance meeting was instrumental in building a relationship between the Native Americans and the settlers. 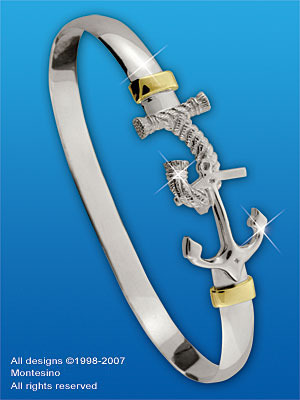 Celebrate our pride in the 400th Anniversary of Jamestown with the Jamestown Hook BraceletTM...a true symbolic treasure.